This is the imprint of a fragment of sea urchin shell (or "test"). Look up "Cidaris" and you will find pictures of these fossils - or even recent ones, as they are still living today, covered during life with big spines, which can also be found fossil. The rock is flint, which is a form of silica that occurs in bands in the Chalk (eg at Pevensey) which means it will be around 80-90 million years old. Try pressing some plasticine into the cast and you will see what it looked like originally. 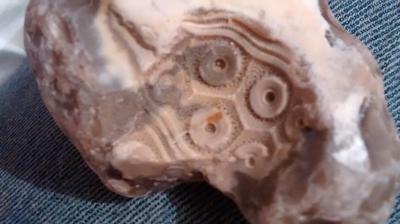 This looks like coral fossils. This area is full of marine fossils that are from the late Cretaceous Period.